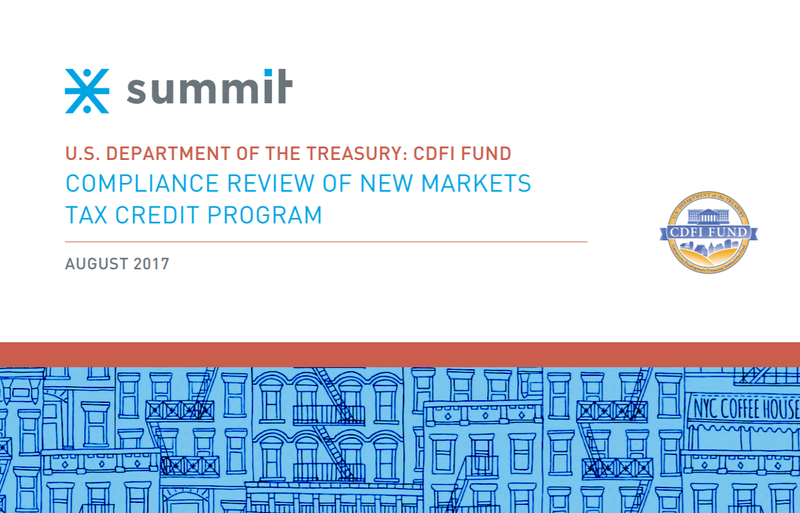 Washington, D.C. – The NMTC Coalition was pleased to see a new independent report commissioned by the U.S. Department of the Treasury’s CDFI Fund to evaluate the operation and outcomes of the New Markets Tax Credit (NMTC) program. The purpose of the NMTC is to provide an incentive for private sector investment in economically distressed rural and urban communities. The report was conducted by Summit Consulting, LLC, a specialized analytics advisory firm comprised of economists, econometricians, and research scientists that assist federal agencies, financial institutions, and litigators in modeling risk, evaluating program performance, and predicting future performance. CDEs evaluated “appear to make NMTC investments in highly distressed census tracts surrounded by other distressed areas. Established in 2000 in the Community Renewal Tax Relief Act (P.L.106-554), the NMTC was created as a bipartisan effort to stimulate investment and economic growth in low-income urban neighborhoods and rural communities. Congress extended the NMTC for five years as part of The PATH Act. (P.L. 114-113) in December 2015. Since the federal NMTC was first implemented, the CDFI Fund has provided $50.5 billion in tax credit allocation authority to promote public-private partnerships and spur investment to some of our nation’s hardest hit and persistently poor communities. During this period, the program has leveraged a total of $80 billion in investments to locally-driven projects and created some 750,000 jobs in areas with unemployment rates at least 1.5 times the national average or with poverty rates of at least 30 percent. In FY 2016 alone, the CDFI Fund, which operates the program at Treasury, reported that the NMTC delivered $3.16 billion in financing to 530 businesses, community facilities, and economic revitalization projects. Communities put that capital to work, creating nearly 11,000 permanent jobs and almost 27,000 construction jobs in areas with high levels of unemployment and poverty.